Here you will be able to see upcoming dates for any of the training formats below, including our 24/7 Self-Guided courses and FREE "try-before-you-buy" courses. 1. "READY WHEN YOU ARE" Self-Guided Training - This is a collection of self-paced training courses. Although they are Non-Certification Courses in themselves some of the key courses may be credited (academically and financially) towards Certification. Training is delivered using instructive videos, written class support material available for download, and optional quizzes that are given via a state of the art university-style e-learning platform. These individual topic-focused self-guided courses are designed to enable participants to inexpensively acquire practical, hands-on EMF detection and protection basics, and go on to achieve their EMF Consultant Certification if they wish. One example is the Cellphone Safety for Smart Users self-guided course, which offers a percentage of its cost (in actual dollar-value) credited towards the cost of tuition for Certification training within a year. This means that a significant portion of the cost of this self-guided course is returned to you as an incentive, to help offset the costs, to acquire more advanced training. Self-Guided courses range from $25 - $300, but not every Ready When You Are course may be credited towards certification - some are for special interest only -- so look for this credit info in the course description, which is posted separately for each self-guided course in the EMF Experts Classrooms. Ready When You Are self-guided courses are the EASIEST, FASTEST and MOST CONVENIENT way to get your EMF training started now . Try out one of our FREE self-guided courses in the EMF Experts Classrooms, to get a feel for the quality of the training content, the instructor(s) teaching style, and the ease of using the university style e-learning platform. 2. EMF Expert Consultant Certification - Live Virtual Classroom training with instructor/student interaction conducted on-line using powerpoint presentations, audio and visual aids. Virtual training is available in two forms: the 12 Week School (Weekend or Night School) version once a week 90 minute class for 12 weeks (total 18 hours), and the twice a week 6 Week Fast Track Certification at double the pace. Additionally, homework research, field work and hands-on assignments, will be required as well as a final exam. Successfully passing the prescribed course of training results in EMF Expert Certification with a listing in EMF Experts Directory. (Price: See the calendar for various course prices, or send us an inquiry using the form below for current prices with any specials or discounts). 2. EMF Expert Certification - Live Seminar style on site with training and workshop activities. 3 days 6-7 hours per day totaling 20 contact hours and a final exam during a single week at select locations. Successful passing of the final exam results in certification as an EMF Expert and listing in EMF Experts Directory. 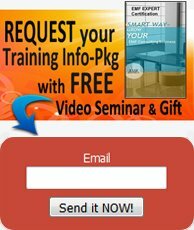 These live seminars are typically hosted by a particular company for their employees and may be closed to pubic participation. (Price: See the calendar for various course prices, or send us an inquiry using the form below for current prices with any specials or discounts). 3.Mentorship EMF Expert Certification - Mentor style training via live online one-on-one classes is the Cadillac of the certification training options with training and exam certification completely individualized to fit your training needs, business goals and time frame. Schedule your private lessons entirely at your convenience and pace, and take your certification exam anytime once all training topics have been completed. Your private mentoring continues with unrestricted direct mentor access by phone or virtual classroom as needed for 6 months, to ensure your business success as a Certified EMF Expert Consultant. 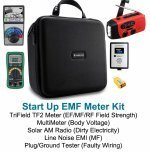 Mentored training includes Certified EMF Expert Directory listing, and 6 months of private mentoring is included. (Price: See the calendar for various course prices, or send us an inquiry using the form below for current prices with any specials or discounts). 5. EMF Consulting Business Launch Course - Live virtual classroom training with instructor student live-interaction conducted on-line with written content, audio and visual aids. Designed as an optional add-on for EMF Certification graduates. Six 90-minute classes plus class assignments. Refer to the business launch training topics included above. (Prices: See the calendar for various course prices, or send us an inquiry using the form below for current prices with any specials or discounts). Request your Training Info Packet for a complete 14-page description of all our training courses, with current prices and any available discounts.